Look at the comments below any new product launch from the big guitar and amp brands and you’ll invariably find people queuing up to tell them what they should be doing instead, usually followed by a string of angry emojis. It’s hard not to feel for these iconic companies, because they made their names producing the definitive gear of the last century, yet still have to make a living in this one. One such brand is Marshall. 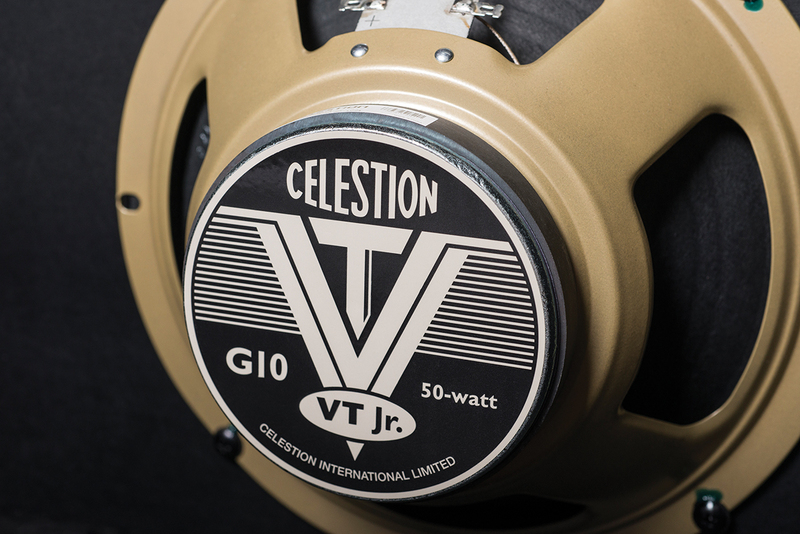 The world’s most famous amp brand has been doing a decent job of balancing innovation with heritage, pushing on with hi-tech new products while keeping its vintage reissues in the catalogue for those who just want the classic tones of the 60s and 70s. 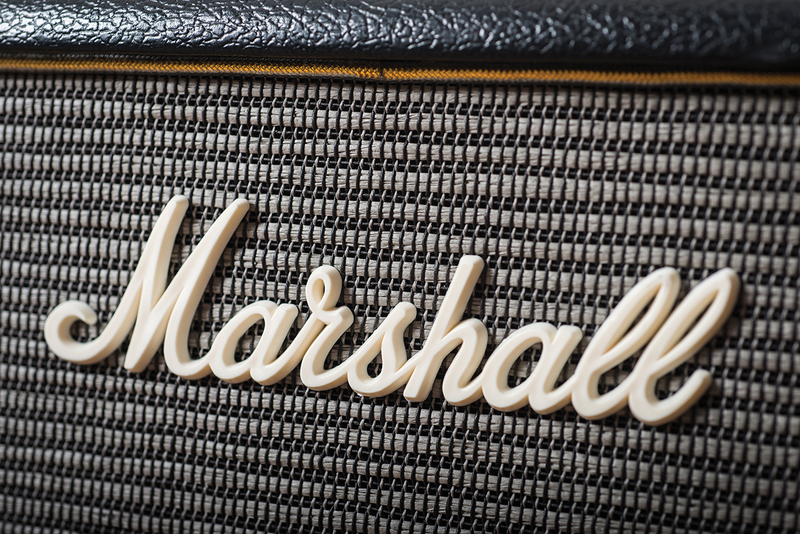 This brings us to the Origin range – Marshall’s big new release for 2018, which might be the brand’s most interesting launch in years. The Origin name suggests a return to the earliest days of the company, but in fact this is an attempt to please just about everyone. How? 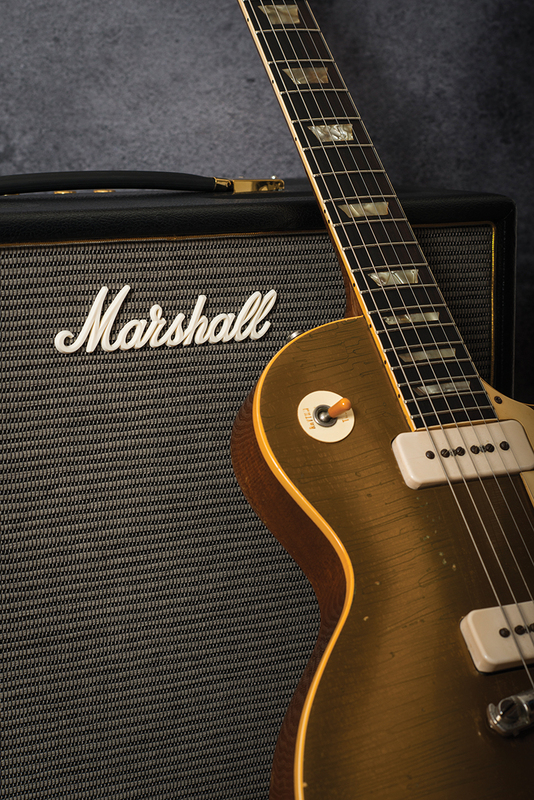 By combining traditional Marshall valve tones and styling with a bunch of useful contemporary features – let’s dive in. The Origin series comprises two heads and three combos, ranging in output power from five watts to 50, and this 20-watt combo should be the Goldilocks ‘just right’ model for a lot of guitar players: powerful enough to gig, but small and light enough to hoik out of the boot without worrying about sending your back into spasm. It’s about the same size as a blackface Princeton, and sure enough the Origin 20C is a 1×10, with a Celestion G10 VT Jr pumping out the noise. If you’re worried that’s not going to give you enough oomph to blast away your drummer’s hangover, there are outputs for eight- and 16-ohm external cabs, so a full stack isn’t out of the question. 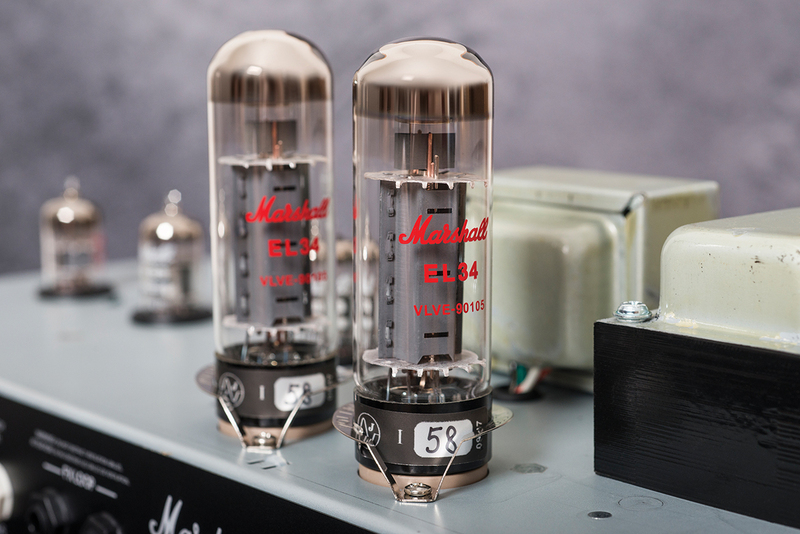 Take a couple of steps back along the signal path and you’ll find that the output valves are EL34s – big bottles we’re used to seeing in louder amps than this, and an interesting change from the EL84s favoured by many modern 20-watters. This suggests an emphasis on Plexi-style grind rather than sparkly treble. So, those contemporary features that we mentioned? Technophobes will be relieved to hear that we’re not talking about Bluetooth trickery or even digital effects, here – just refined ways of controlling things. And there are clues to three of these functions on the top panel. 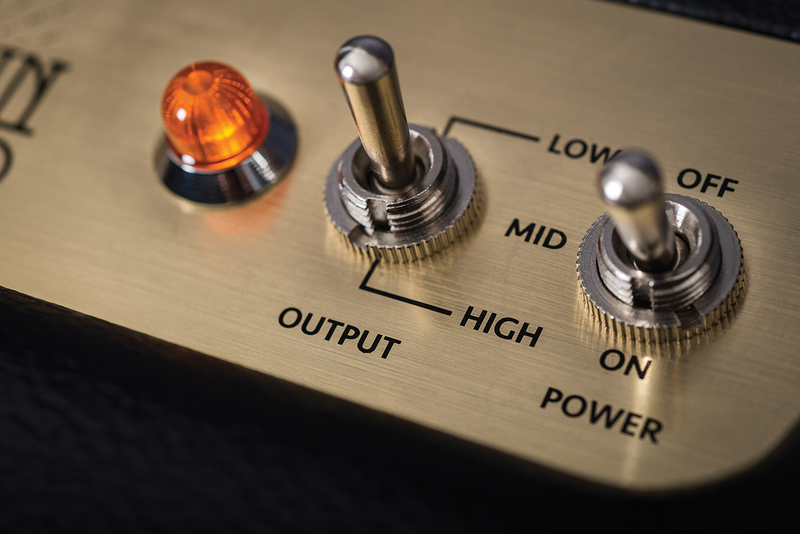 First up, there’s a ‘pull boost’ option on the preamp gain control – nothing too radical there. But right next to that, before we get to the familiar bass, middle and treble controls, we see a knob marked ‘tilt’. No, this doesn’t cause the amp to lean over to one side as a way of discouraging bandmates from resting their drinks on it. In fact it’s a simplified take on the old Marshall trick of patching between normal and high-treble channels then adjusting the relative levels for a richer tonal palette than either channel on its own. Why they didn’t just call it ‘blend’? No matter – it’s a brilliant idea. The third thing you definitely won’t find on an original Super Lead is the three-way output level switch, allowing you to drop down to three watts or around half a watt. 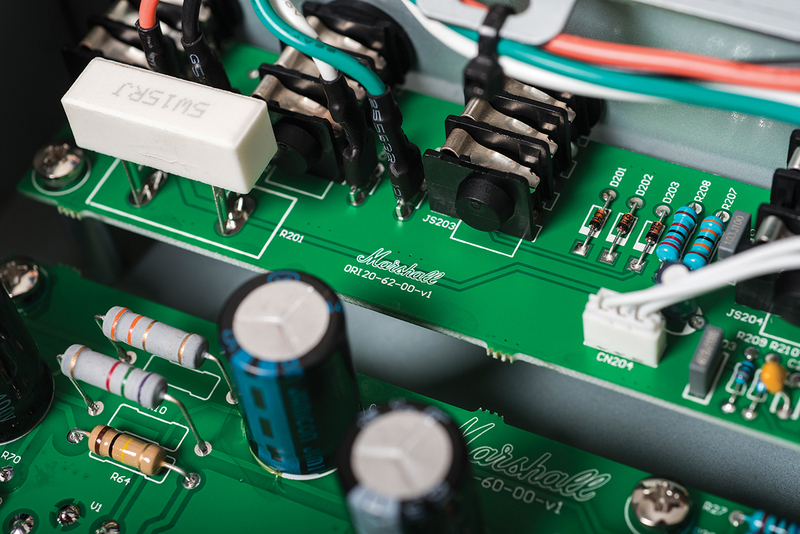 Marshall has clearly recognised the need to cater for bedroom players with short-tempered parents and/or neighbours; its Powerstem system works by lowering voltages around the power stage. There are a couple more extras skulking round the back, too: a DI output, EQ-treated to send a usable tone directly to your recording interface; and an effects loop. There’s also an input here for the included footswitch, which can be used to bypass the boost and the loop. 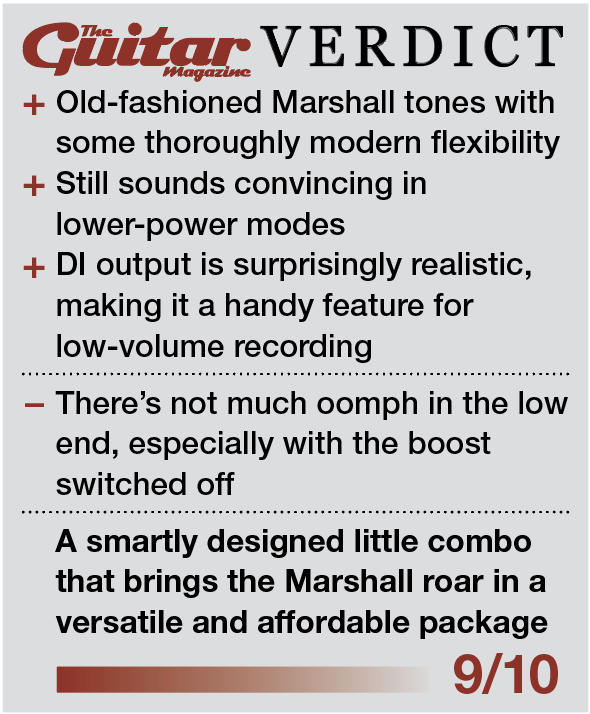 Your reviewer used to gig with a Marshall JTM30 1×12 combo back in the day, and while it’s an amp that’s now remembered mostly for reliability issues, it did sound pretty great in a boxy kind of way. In voicing terms, the Origin 20C is quite similar. Perhaps not surprisingly given its dimensions and 10-inch speaker, the sound is focused on that classic British midrange rather than floor-shaking bass… which isn’t necessarily a bad thing. In terms of basic sonic character, it’s totally ‘small Marshall’ and really rather loveable. There is some clean headroom, but not much, and the output valves will contribute an element of crunch if you crank the master level; as with any master-volume Marshall, balancing this with the preamp gain is key to controlling the overdrive’s intensity and the amp’s overall meatiness. This isn’t a metal amplifier by any means but it does get plenty feisty enough for the rest of us – and the output switch does a fine job of scaling things down without getting all limp and fizzy. Half a watt is never going to sound as engaging as 20 watts or even three watts, but for late-night practice in the same room as a sleeping cat, it’s more than acceptable. A speaker-silencing headphone port would have been even more moggy-friendly, but the DI output is extremely useful in its own way. While it doesn’t mute the speaker, we’re pleasantly surprised by the quality of the tones it provides for microphone-free recording. There’s none of the plasticky top end you sometimes get from DI outputs with half-hearted cab simulation, and we could quite happily use this for rhythm guitar sounds without feeling the need to run it through a separate amp plug-in – a bit of compression and roomy reverb is all it really needs to sit naturally in a mix. But let’s get back to the top panel, because we have more features to explore. First up is that gain boost… and it’s not what you might expect. Rather than simply adding a spoonful of neutral drive, it’s a real fattener, turning wiry edge-of-breakup tones into something much more substantial. With most of our test guitars this is a real boon on the bridge pickup, although it tends to make things a bit flubby as soon as we flip to the neck, even with single-coils, and even when playing through a larger, open-voiced cab. You might need to tweak the EQ to keep things balanced here. 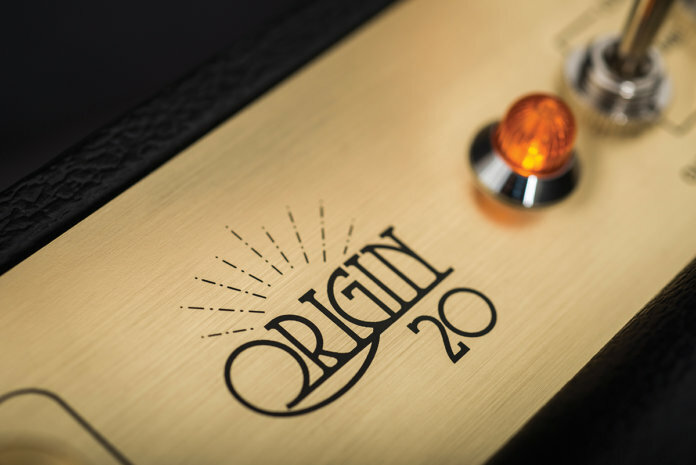 Speaking of which, while Marshall is not exactly renowned for the dramatic effects of its tonestacks, your sound-sculpting options with the Origin 20C are actually rather impressive. The bass knob does what it can within the limitations of what is essentially a bass-light amp, while the mids can be pushed for extra raspiness or dialled right back for a more sweet, almost Fender-like tone; but it’s at the top end of the spectrum that you can really get twiddle-happy. 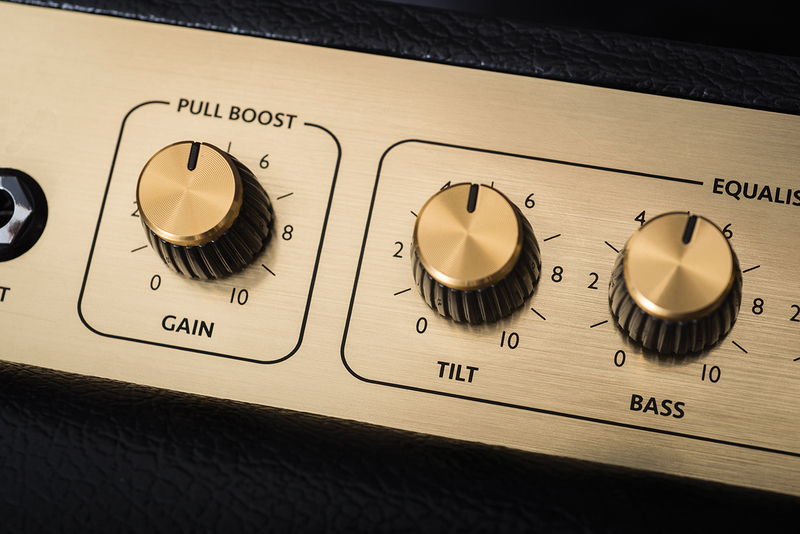 High frequencies can be controlled in three ways: via treble, presence or tilt. That might sound like overkill on a diddly amp that doesn’t even have room for reverb or channel-switching, but in truth it’s a telling sign of the real priorities of the designers – because it’s all about being able to nail the precise tone that your capricious ears are yearning for. Each of the three knobs operates in its own distinct way: treble controls the really high stuff, presence is focused on slightly lower frequencies for taming those biting transients, and tilt… well, the newbie turns out to be the most interesting of the three. At halfway, the core sound is perfectly well balanced; cranking it towards the trebly end adds freshness and zip to the body of the sound in a completely organic way, while going the other way softens things up without going muffled. Yes, it sounds relatively dark at zero and relatively piercing at full, but the sounds at both extremes remain usable. Maybe two separate volume controls would feel more intuitive to play with, as on a patched two-channel amp, but it’s an efficient way of achieving the same results. For this clever and tonally gratifying feature alone, Marshall deserves a pat on the back, and it sums up the clever way that the company has gone about the whole Origin project.